one for Yoga I rather like. 2pixels base. one for solio, which the symbol for which didn't come out too well. 2pixel base. leanne's doll, which I adore^.^ I like the way the hair came out and the jacket, and it was the first time I'd used that base by Jenn. 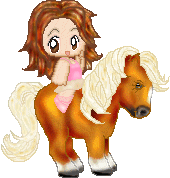 one for Emma, which I decided to do the pony for, as to give myself a 'fantastic!' rating.. ^^;;; Like the way it came out:) I can't remember where I found the Little Pony base at, 'cause I used google, but the girl is angy chan, I believe. Nixie's.. Anyways, she wanted a waitress outfit, so I scrounged for google^.^ I love having reference pictures to use^.^ They always turn out so much nicer. Anyways, she'd asked for a tray and soda as an accessory.. But I couldn't resist giving her a little mishap^.^ Aine base by Faerie Grrl. Silver's. Had too much fun doing the grass skirt, even if I'd prefered a tablet to do it with^.^ it probably used more layers than the rest of it, until I merged them. Base is la donna bella by Star Tippers. another one for Angel^.^ I like it, Emby quin diva base. The skirt looks weird on black because of a bit of sharpening I did for the plaid, but hey, I love the hair^.^. Raine's, whose hair I love. Had fun with the jeans too, and the little demon on the shirt. Base is also by Jenn. The doll here is a Lulu doll from FFX^.^ Yes, I know, very over-done, but it was too much to resist. The belts are crappy, but I love just about everything else, especially her jewelry, coloring, and moogle^.^. This has been redone since--check later pages:) Base is by Amelia.